The first time you use a webcam for time-clocking there are a few simple steps that need to be followed. Under the tab 'Time Clock' after you try to clock in select the radio button to allow Humanity access to your webcam. It's also recommended you select the check-box to remember this for future time-clocks. Select your webcam from the drop-down list. If you are unsure of which one is the right one you can always right click on the Flash Player and select "Choose Webcam" to select another. 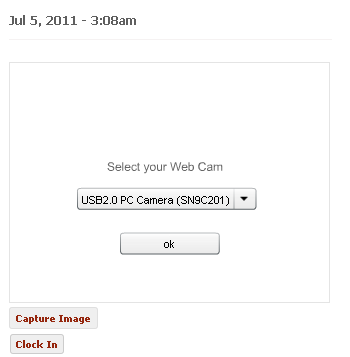 Most commonly it will be called 'USB Camera' (you will only have to do this once).